The new wave of technological innovation is coming to your home by way of automation. You will soon be able to control most aspects of your home, from locking doors to turning on lights to opening and closing the garage, with your smartphone. One of the newest and most fascinating technologies in the automation market is Lockitron, which allows people to control the locks on their doors through a device that’s installed over the interior deadbolt. Homeowners will be able to lock and unlock doors — and keep track of whether the door is locked or not from anywhere in the world, as long as you can access an Internet connection. 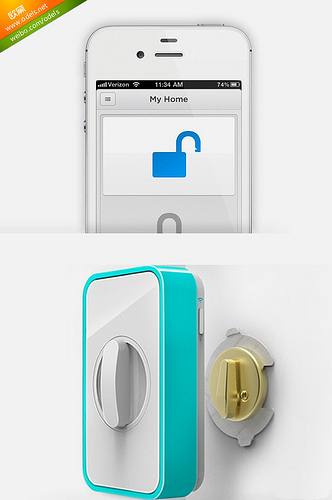 After being turned down by Kickstarter, Lockitron raised all of it’s seed money on its own and is now one of the hottest inventions out there, through home automation or otherwise. Meanwhile, there are already features on many of the appliances and electronics with automation technology. Garage doors have been automated for years but now can be opened and closed from just about anywhere, working in a similar way as Lockitron. This is all especially helpful when you’re on vacation or away on a business trip as your smartphone becomes the control center for your home, and its security, showing you what you may have forgotten about or, soon, when someone is knocking on the door to your house. There are even pet-feeding systems that allow you to feed your pets through a device that connects via Wi-Fi through your smartphone so that you won’t even have to come home to feed your pet, which might make them a little lonely. Of course, there are concerns about how secure this may be. All digital inventions can be hacked in some way, and when it comes to locking and unlocking doors in a home that’s supposed to protect people and valuables, you have to figure thieves will figure out how to override the system in some way. According to www.securitycompanies.com, homeowners should consider these risks when deciding between a DIY system and an established provider. While DIY systems save money over time and are easy to install, some residents may prefer the peace of mind that security professionals deliver. Remember, the security companies you hire to watch your house has people on standby 24/7 to respond if anything happens and will contact the authorities. However, you have to figure these automated systems will have that option soon. As technology becomes more active in all of our lives, you have to figure it will only serve to bring places like our homes to life in our best interests. Image by é»› æ¬§ pursuant to the terms of Creative Commons license.